Day 32: More than 50 rockets landed in northern communities Saturday. Six people were lightly injured by shrapnel. The last barrages hit the Akko area at around 7 p.m., causing several people to suffer from shock. Earlier, rockets landed in the Krayot area near Haifa, in Maalot, Akko and the Western Galilee. In the afternoon, five rockets landed near Safed, one directly hitting a house in one of the communities in the areas. Rockets also fell in Kiryat Shmona, and Carmiel. 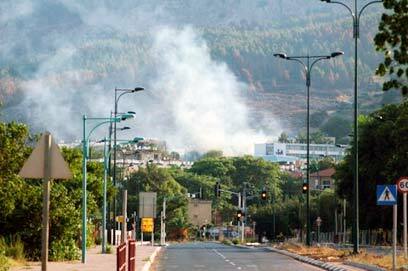 In the Krayot area, near Haifa, the rockets landed in open areas and did not cause injuries. In Akko, six rockets landed in the last barrage, while four rockets hit Carmiel, one of them hitting a building. Three people suffered from shock. Sirens were also heard in Haifa, but no landings were reported. In the Western Galilee, one of the rockets hit an industrial building. Two fires broke out in the area, and Western Galilee firefighters worked to prevent them from spreading. In the afternoon, a rocket hit a house near Safed. Two people were lightly injured by shrapnel and three people suffered from shock. Ofer Zivaon, 34, who witnessed the attack, told Ynet: "A rocket struck the bedroom, the roof was totally destroyed. The windows are gone. The shower is also completely ruined. Shrapnel fell on the road. I'm a resident of the place, and this is the first time that a rocket landed here." Zivaon said that no siren preceded the attack. "No siren was heard in the community. They prefer not to activate it so as not to frighten the children. I have spent so much time in Lebanon that it doesn't scare me." One of the rockets struck a house in Safed, and one person suffered from shock. Several other rockets landed in the Kiryat Shmona area. Police said that one person was lightly injured and two buildings sustained damages. A siren was also heard in Tiberias, but no rockets landed in the area. All the people injured in the various attacks were evacuated to the Ziv Medical Center in Safed. About 13 rockets landed in the Maalot area, two of them directly hitting houses. Two people were lightly hurt and 15 suffered from shock. Rockets also landed in open areas near Shlomi, starting fires in several places. The police reported that 3,650 rockets have landed in Israel since the onset of the fighting, 835 of them inside cities. About 930 rockets have landed in the Kiryat Shmona area so far, 730 in the Nahariya area, 584 in the Maalot area, 448 in the Safed area, and 181 in the Tiberias area. On Friday, Hizbullah fired a Khaibar-1 rocket at Haifa. The explosion of the 320 mm rocket echoed as far south as Hadera, residents said. A barrage of several long-range Katyusha rockets landed in the city on Friday, with one of the rocket slamming in the midst of the coastal highway, which was reopened in the afternoon. In Kiryat Shmona, a man was moderately injured by shrapnel from a rocket that hit a building Friday afternoon, paramedics said. Several people were treated for shock and firefighters battled a fire that broke out in the 11-storey building. See all talkbacks "Rockets land near Haifa, Maalot"